When it comes to summer, I am all about flowy dresses, jeans shorts and pretty tops. One thing, that always has to match those choices are my shoes. I really am the stereotypical woman in the sense that I could buy new shoes everyday for a whole year and still wouldn’t be bored of them. And celebrate that love for shoes I am going to show you my personal favourite summer trend shoes of 2017: The mules! For this post I teamed up with the lovely Lina from Glittery Peonies. We met on Instagram a couple of weeks ago and I instantly fell in love with her beautiful pictures and content! On her amazing blog, she writes about all the beautiful things in life like fashion, beauty and food. We both are obsessed with footwear, that’s why we decided on showing you our personal favourite summer trend shoes. Hint: She picked another style! Thanks for collaborating with me Lina – you are wonderful! The day we shot this outfit it was really hot here in Austria. That’s why I decided to go for my favourite denim shorts and paired it with a beautiful off-the-shoulder top with sticked detail. 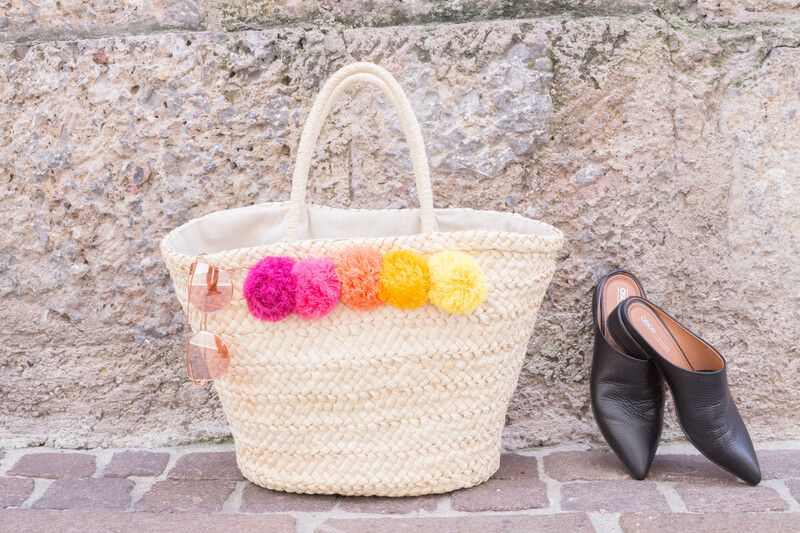 To top off the look, I added my lovely straw bag with pom poms. This is the bag, I already showed you in my straw accessoires round-up. If you are still looking for a bag like this or a straw hat with embroidery, head on over to the post where I put together a selection for you! Which summer shoe trend to you love the most? Im Sommer dreht sich bei mir alles um schöne Kleider, Jeans Shorts und hübsche Tops. Eine Sache, die dabei immer passen muss, sind meine Schuhe. Ich erfülle wirklich alle Klischees einer Frau, wenn es um Schuhe geht. Ich könnte mir jeden Tag ein neues Paar kaufen und hätte immer noch nicht genug davon. Um diese Liebe soll es auch heute am Blog gehen. Wie der Titel schon sagt, zeige ich euch heute meine liebsten Summer Trend Shoes 2017: Die Mules! Für diesen Post hab ich mich mit der lieben Lina von Glittery Peonies zusammengetan. Wir haben uns vor ein paar Wochen auf Instagram kennengelernt und ich hab mich sofort in ihre schönen Bilder und Inhalte verliebt. Auf ihrem hübschen Blog schreibt sie über die schönen Dinge im Leben wie Fashion, Beauty und Essen. Wir beide lieben Schuhe, weswegen wir euch heute unsere persönlichen Favoriten für den Sommer zeigen. Pssst: Lina zeigt euch ein ganz anderes Paar! Danke für die coole Zusammenarbeit Lina – du bist spitze! An dem Tag, an dem wir das Outfit geshootet haben, war es wahnsinnig heiß. Deswegen hab ich mich in meine liebsten Jeans Shorts geschmissen und ein hübsches Off-The-Shoulder Top mit Lochstickerei entschieden. Dazu kam dann noch die hübsche Strohtasche mit Pompoms, die ich euch bereits in meinem Stroh-Accessoires Guide gezeigt habe. Wenn ihr noch immer nach einer Tasche wie dieser hier oder einem bestickten Strohhut für den Sommer sucht, schaut doch mal bei dem Post vorbei! Welchen Summer Trend Shoes mögt ihr am liebsten? 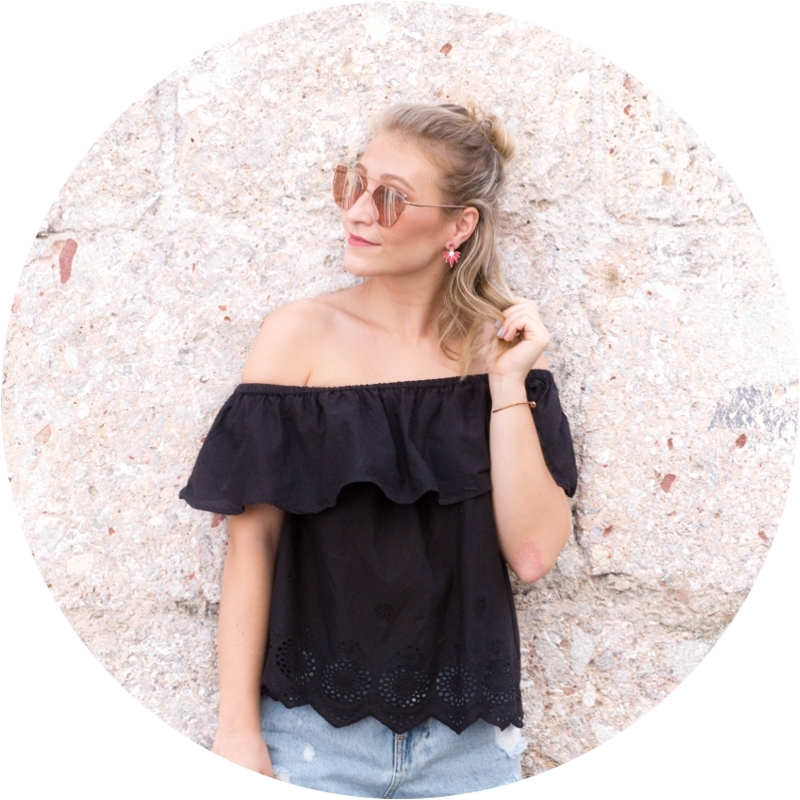 Such a cute top – I’ve been obsessed with the off-the-shoulder trend, even despite it being a trend, ha! This look is so cute! I’m loving the OTS top and the mules! That bag is so fun! And I LOVE mules, they’re so easy and classic! I love that off the shoulder top! And what a cute bag! What great shoes!! I love having cute comfortable shoes for summer!! Love this outfit! Your bag is TOO cute! Love this look! Those shoes look sooo comfy, but still stylish. i loveeee your bag!!! Your shoes are super cute too! Those shoes look beautiful! I have trouble keeping some mules on my feet, but if you say they “hug your feet”, I’m sold! Plus, they look way more expensive than ASOS, good find! What a fun summery outfit!! Have a great weekend girl! I need every piece of this outfit in my closet! That black top is gorgeous, and I would love to rock those mules to work. 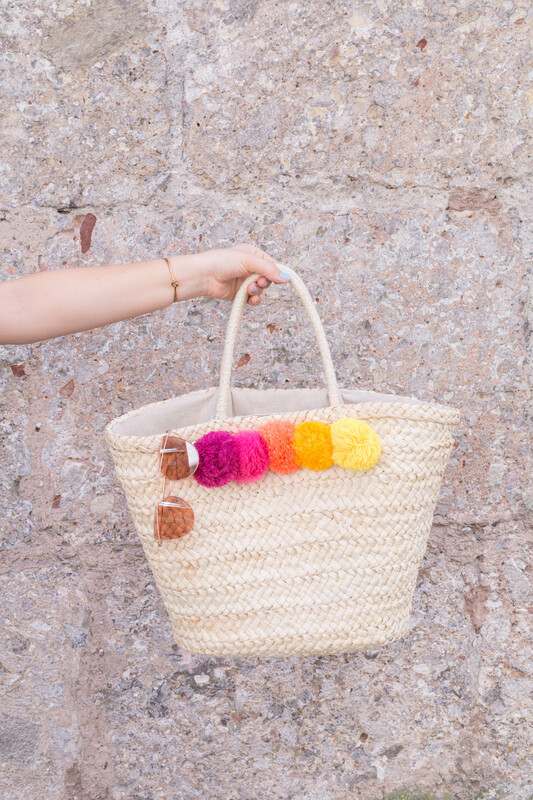 And how perfect is that bag for a day of adventuring or just going to the pool?! 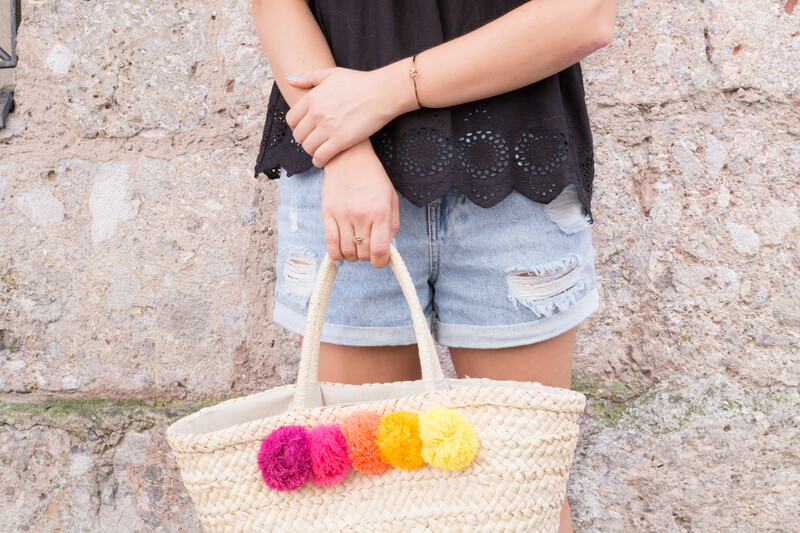 Obsessed with your tote and the pom poms, so fun for summer!! Hihi das freut mich fest, danke Katja! Wow! Die Tasche gefällt mir sehr! Du siehst super aus! 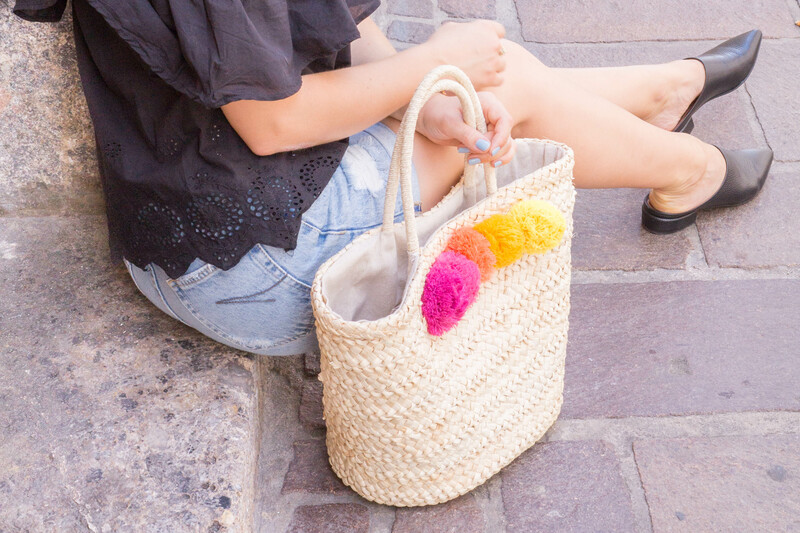 This bag is so cute and perfect for summer exploring! It is! And it holds a ton! Wow, da hast du mit deinem Outfit genau mein Geschmack getroffen. Ich musste mich auch zuerst an die Mules gewöhnen, aber jetzt bin ich auch total Fan von ihnen. Die Tasche ist übrigens total schön und super passend für den Sommer. Danke Lena, so ein liebes Kommentar! Hab ein feines Wochenende! wieder mal ein wunderschöner Post mit tollen Fotos! Du bist halt eine richtige Beauty <3! Ich mag dein Outfit und habe mich in deine Bluse und die Tasche mit den Pom Poms verliebt. Danke Verena, freut mich! Vorallem, weil ich deinen Stil ja auch so schön finde! Cool, die Shorts sind gekauft! Du siehst schön aus im Outfit! Die Tasche ist perfekt für den Stadtbummel! Ja find ich auch! Danke! Ein tolles Outfit hast du dir da ausgesucht und deine Bilder sind wie immer top. Mein Favorit ist deine Tasche, an die Schuhe allerdings müßte ich mich erst noch gewöhnen, die sind nicht so mein Ding. Ja, das mit den Schuhen verstehe ich total! Sind schon sehr gewöhnungsbedürftig 😉 Danke dir! Das ist ja ein richtig tolles Sommeroutfit. Finde das Oberteil richtig hübsch. Die Tasche ist auch richtig toll. What a gorgeous summer outfit! I love those sunglasses! Wow, ein schönes und passendes Outfit für den Sommer, steht dir super! Danke Carina, freut mich, dass es dir gefällt! Hihi danke Nadine, so ein liebes Kommentar!